One of our goals is to develop a cost effective and user-friendly technological solution to enable rapid creation and delivery of personalised playlists for people living with dementia. Creating personalised playlists is currently too expensive and time-consuming for music to be adopted widely as a therapy in health and care settings. We want to develop a user-friendly, technology-driven approach to enable creation of personalised playlists in under an hour. Care homes in particular can be challenging settings for delivery of personalised music; equipment goes missing (particularly small objects such as MP3 players), Wi-Fi can be unreliable and underfunding drives the need to keep costs to a minimum. We need to develop simple, user-friendly personal music delivery systems appropriate for use by busy carers in such settings. We have been very fortunate to receive pro-bono help from experts in various fields, throughout our work. 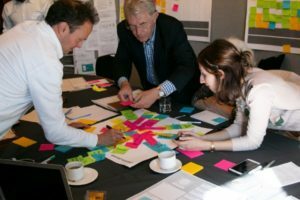 And it was with such help that we achieved a 2-day Service Design workshop in September 2018. We were joined by professionals in the field, from London and New York, who helped us organise such a creative and productive event that got together some of our stakeholders in the same room – from relatives of people with dementia, to carers, medic al professionals and technology experts. Since the Workshop, we have been taking the action to fulfil the plan that results in a cost effective and user-friendly technological solution to enable rapid creation and delivery of personalised playlists for people living with dementia. Developing and building an app is an essential step in the process of bringing personalised playlists to people living with dementia in a quick and efficient way. The ability to build a quick playlist through an App, based on people’s musical background, will enable research into the positive effects of music, on a much larger scale than is currently possible. This will allow for an evidence base to be built through research, which will in turn support the case for adopting this approach as standard of care for people living with dementia. We have estimated that the budget for developing this App is £19,000. When we have raised that amount, we can commence work on building it and testing its efficiency with actual residents in care homes. If you would like to help us get there, you can read more and donate on our crowdfunding page, through the link above. Sign up for newsletter updates here to be the first to know about our next developments.